The January 2019 Greater Atlanta Coin Show began the new year with a cold overcast day outside and a bourse filled with dealers and their displays of numismatics and other collectibles. Thank you to everyone for coming to the first show of 2019. We are glad you joined us to view the many items in the dealers' showcases and discuss the many aspects of collecting and investing in coins, currency, bullion and other items seen on the bourse. We appreciate all the visitors, all the dealers, our security and the hotel's staff for helping make the show each month. As usual for a Sunday at the hotel, the show shared the conference area with several churches. Sometimes we hear their joyful noise, and sometimes their guests visit our show. A win-win. This month, several of our dealers participated in the early F.U.N. (Florida United Numismatics) show. Some decided to stay at the Orlando show while a few came back to be at our show. Feedback from the dealers at F.U.N. was the show was very good. We're glad they had a successful experience. When regular dealers miss our show, we provide opportunities to those dealers on our wait-list to set up at the monthly show. Welcome and thank you to the several guest dealers we had this month. The overcast day starting in the 30s dampened our traffic in the early morning. However, as the day progressed and became somewhat warmer, more people began arriving to browse, buy and sell among the coins, currency, bullion and other interesting items. We especially want to welcome the young visitors to the January show. Though we had several, two in particular stand out. One was a young boy scout learning about numismatics. Another was a young girl adding to her already impressive collection. We always enjoy seeing the younger people attending the show and becoming interested in the collecting hobby. It teaches history, values and, to a certain degree, patience, in order to find those perfect items to acquire. Of course, the hobby also provides the excitement of a treasure hunt. This month was busy, but we have a few items to show on our virtual look at the January bourse. Once again, the coin show offers a wide and sometimes odd variety of collectibles on the bourse each month. Of course, there are many thousands of collectible specimens at the show with values ranging in the few cents for circulated low-denomination coins to the tens of thousands of dollars for high-end investment coins, currency and bullion. The dealers offer new items of interest in their showcases to add variety from show to show. Join us to buy, sell or just browse among the treasures at the next monthly coin show. Mark your calendars and visit the next Greater Atlanta Coin Show on Sunday, February 10, 2019 in the hotel's Hamilton's Restaurant. But first, we want to remember and say good-bye to one of our long-time dealers who passed in mid-December. 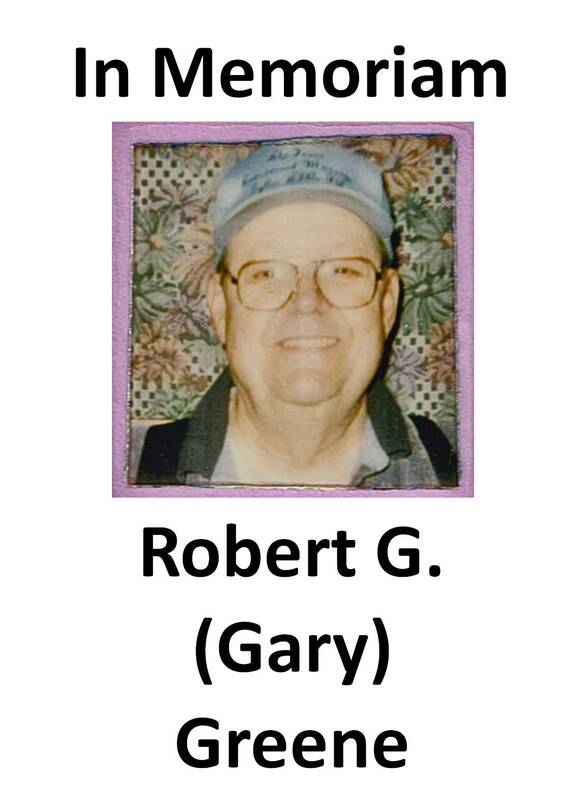 Those at the show saw our In Memoriam display for Mr. R. G. (Gary) Greene of Fayetteville, Georgia, who set up at the monthly coin show for many years. It was just within the last few years that he decided to stop coming to the show regularly due to his personal challenges. We send our condolences to his surviving family members. He will be missed at the show and in the numismatic community. Our first collectible is an odd one from the 1940s. 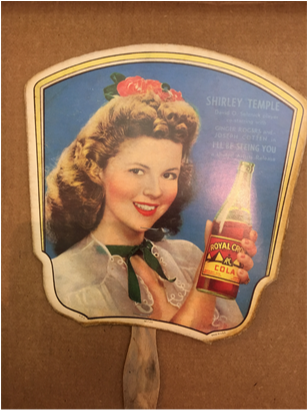 This advertizing fan is both an RC Cola and a Shirley Temple collectible. "The Royal Crown Company had marketing pros that understood the value of advertising and product promotion. With the help of their marketing agency, BBD&O, Royal Crown Cola experienced incredible growth through the 1940s. "Starting in 1939, RC Cola became the sponsor for the CBS radio program “Ripley’s Believe It Or Not” with Robert Ripley. The show was broadcast every Friday evening and both the program and the RC Cola commercials were heard from coast to coast. "Another major component of RC Cola advertising was their print advertising. Starting in 1940 they had color inserts placed into magazines such as 'The Saturday Evening Post' and 'Good Housekeeping'. They also had ads printed in nearly 600 daily newspapers across the U.S.
"Beginning in 1946 they used celebrity likenesses as well as endorsements. The advertisements featured famous movie stars like Lucille Ball, Loretta Young and Joan Crawford. Other stars in their ads were Lauren Bacall, Gary Cooper, Shirley Temple, Bob Hope, Gene Tierney, Barbara Stanwyck, Bing Crosby and Jerry Lewis. 1947 RC Cola ads featured the glamorous Hollywood actress Hedy Lamarr. "A nationwide campaign was begun to promote RC Cola as the best of all available colas, proven in independent taste tests. They started using the slogan, 'Best By Taste Test' and the stars appeared in their ads declaring, 'RC tastes best!' Unlike RC’s main soft drink competition, Coca-Cola and Pepsi, the people at Royal Crown liked the idea of linking their cola to movie stars." 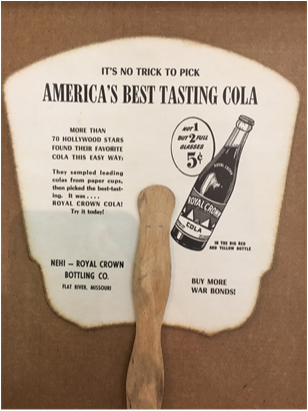 This advertizing fan mentions Shirley Temple's upcoming movie on the front and has black print on the back that mentions the bottling company and implores people to buy war bonds. These fans are interesting memorabilia. Some have red print on the back and also advertize specific businesses. One has to be careful, though, there are reproductions of this specific collectible. The next example is a modern era commemorative silver dollar coin. This coin from 2017 recognized and celebrated the centennial of the Lions Club International, which occurred in June of that year . The United States Mint will soon be offering the Lions Clubs International Centennial Silver Dollar. 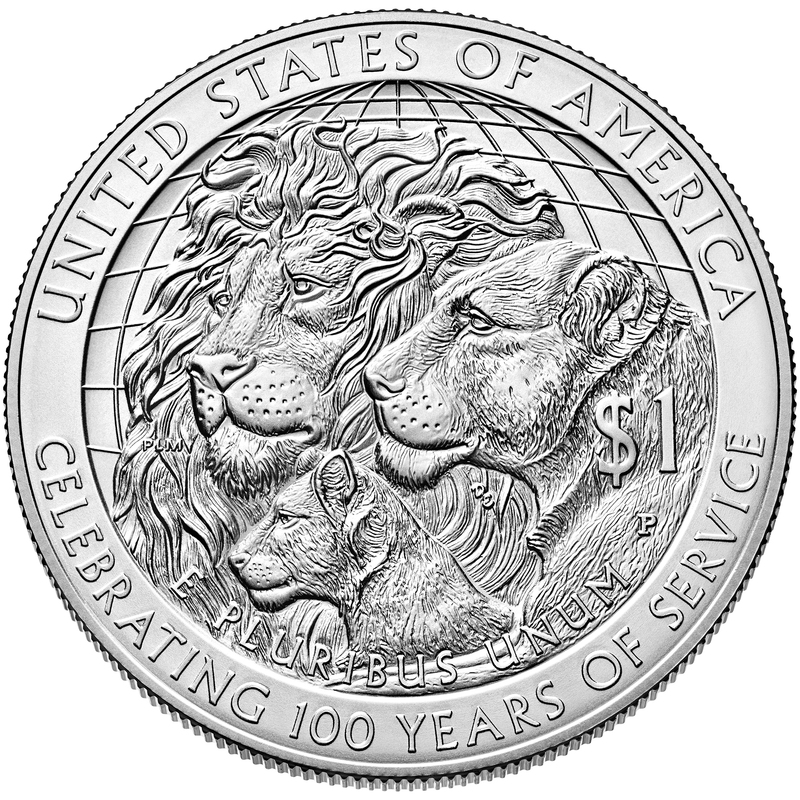 Public Law 112-181 authorizes the Mint to strike and issue up to 400,000 silver dollar coins with designs emblematic of the Lions Clubs International centennial. On June 7, 2017, Lions Clubs International will celebrate 100 years of community service to men, women and children worldwide. Since its founding, it has become one of the world’s largest organizations of its kind. Its 1.4 million members in more than 47,000 clubs provide humanitarian services in more than 200 countries. 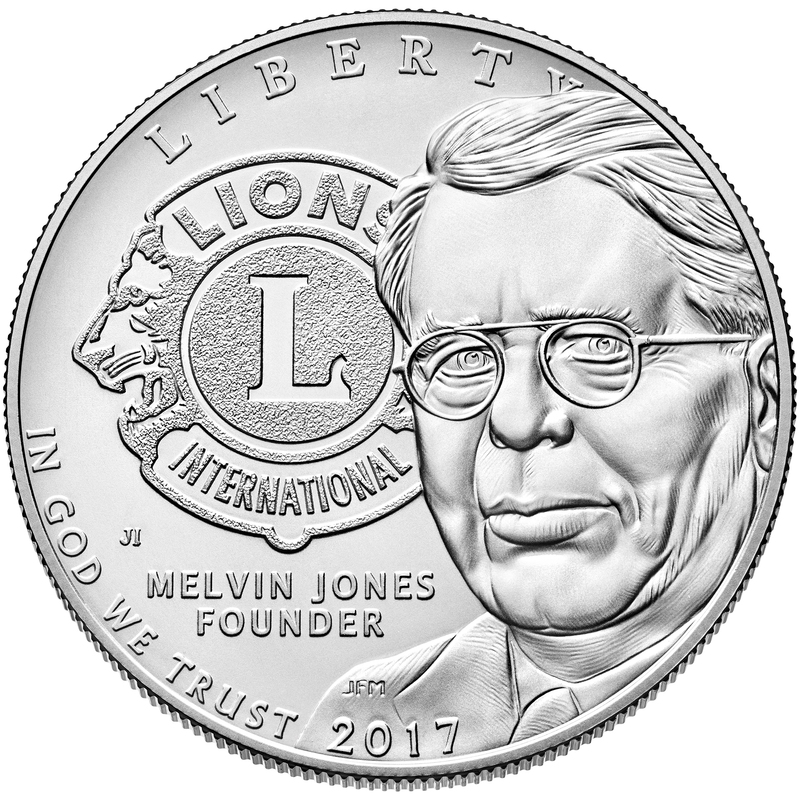 The coin’s obverse (heads) features a portrait of founder Melvin Jones paired with the Lions Clubs International logo. Inscriptions are “LIBERTY,” “IN GOD WE TRUST,” “MELVIN JONES,” “FOUNDER,” and “2017.” The obverse was designed by United States Mint Artistic Infusion Program (AIP) Designer Joel Iskowitz and sculpted by United States Mint Sculptor-Engraver Joseph Menna. The reverse was designed by AIP Designer Patricia Lucas-Morris and sculpted by United States Mint Sculptor-Engraver Don Everhart. The U.S. Mint hosted a ceremonial strike event at its Philadelphia facility on November 9, 2016. Mint sculptor-engraver Joe Menna was in attendance. U.S. Mint Principal Deputy Director Rhett Jeppson was joined by James Franklin Moore, III, Chairperson of the Lions Clubs International Centennial Committee. The coins will be available for sale on January 18 at 12 noon (EST). The price of each Lions Clubs International Centennial Silver Dollar will include a $10 surcharge that is authorized to be paid to the Lions Clubs International Foundation to further its programs for the blind and visually impaired in the United States and abroad; invest in adaptive technologies for the disabled; and invest in youth and those affected by a major disaster. 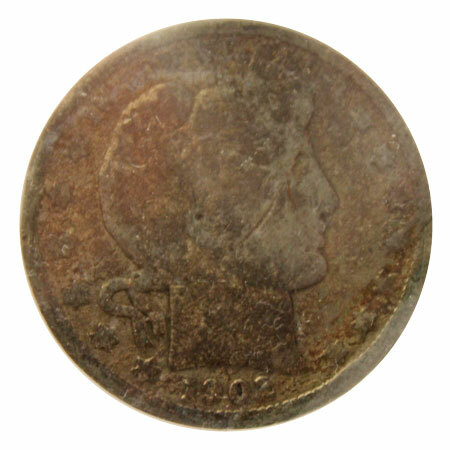 The next specimen is a counterfeit Barber Half Dollar coin. No, this fake was not bought or sold on the bourse, but it does provide insights into counterfeits. Did you know there are two types of counterfeits? There are contemporary and numismatic fakes. This is in contrast to the numismatic counterfeit which was made in order to sell to coin collectors at a significant profit above face value. These counterfeits are usually struck and come in two main categories, the tourist counterfeit, and the coin collector counterfeit. The tourist counterfeits are often in either base metal or lower fineness than the real coins and usually are fairly close in appearance to the genuine coins. They also often can be found with non-existent date/mint combinations and even sometimes mismatched obv/rev mules. 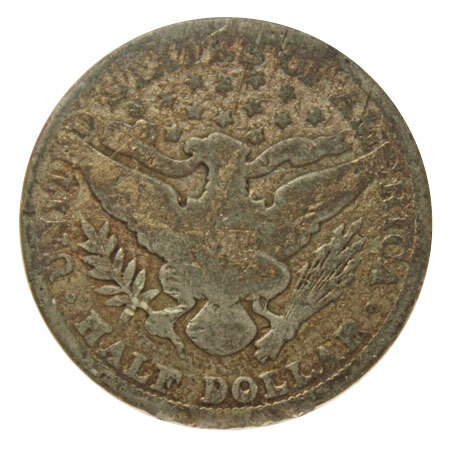 Based on other coin forums and web sites showing images of fakes, it seems the Barber half dollar coins were frequently counterfeited to deceive merchants. The counterfeiters of the day chose to spend their time and resources on making fakes that would pass in the marketplace. Perhaps the buying power of the half dollar justified their efforts. One inflation calculator shows 50 cents in 1900 would be roughly equal to $15.00 today. This particular fake, though it's in a 2x2 flip, feels light. It also doesn't ring with the same tone as a silver Barber half when dropped on a hard surface. Had this been a nice numismatic counterfeit, its physical characteristics would be closer to the real thing. Obverse and reverse images courtesy of the US Mint. 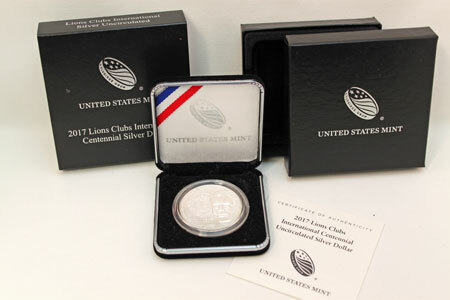 In the latest (January 27) US Mint production report, they show sales of 68519 of the proof and 17247 of the uncirculated Lion's Club silver dollar coins. In comparison to other recent commemorative silver dollar sales, the 17247 uncirculated dollars is a low population. Coins with low population generally become more valuable over the years. 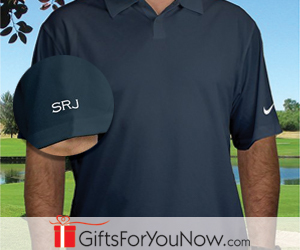 Will this one? Time will tell.